An Ancient Chinese beauty secret now becoming a popular alternative to plastic surgery, Botox injections and pharmaceuticals. This type of facial rejuvenation involves bringing fresh oxygenated blood to the face. It has been proven to stimulate collagen production. Collagen is a protein found in skin cells which stops being produced as we age. A lack of collagen is responsible for wrinkles, fine lines and loss of skin elasticity. The treatment slows down the aging process from within and is well suited for both female and male patients. Bring out your inner radiance without the pharmaceutical side effects or nerve damage of conventional methods. If you have undergone Botox or other cosmetic injectable procedures, you will need to wait 8 weeks until we can administer cosmetic acupuncture on your face. 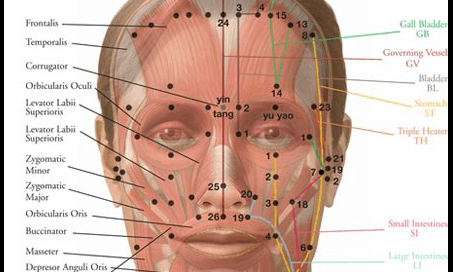 Cosmetic Acupuncture on the face will interfere/ruin the effects of other injectables. If you have undergone cosmetic surgery, you will need to wait 6 months until your tissue has healed before we can adminsiter local needles on the face.